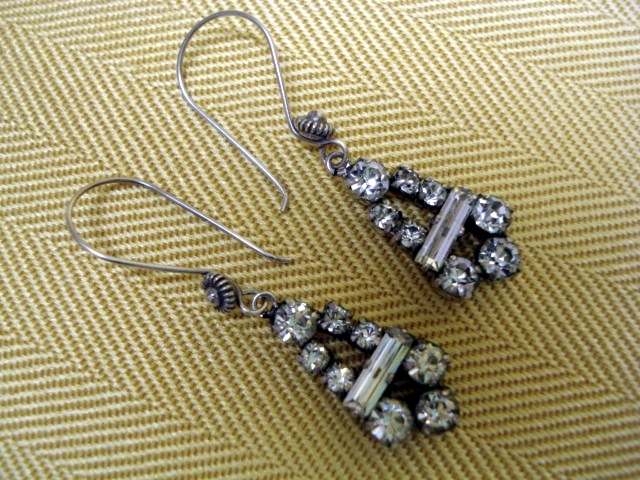 These earrings have great appeal with their Art Deco styling and use of bright sparkling diamante. 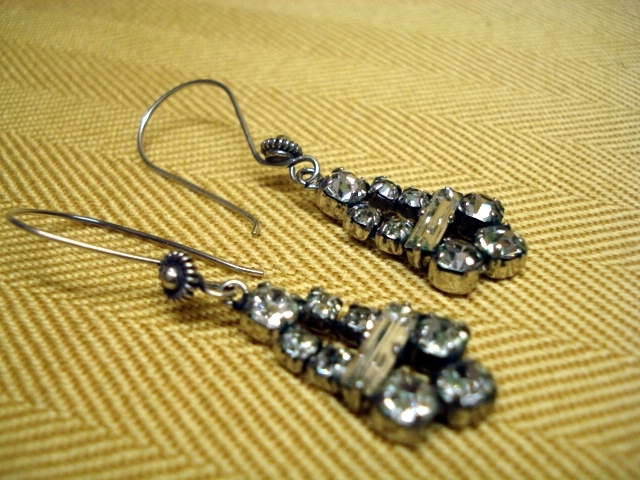 The vintage earring drops, which date from the late 1930's to the 1940's were originally on 'screw-on' fixings. We have put them onto hand-made sterling silver ear wires from Bali to make them suitable for pierced ears. This pair of earrings is in amazing condition and of excellent quality with all the stones being claw set. The stepped design centres around a baguette shaped stone with three large diamante below it and four smaller diamante above,suspended from a single large diamante where the dropper is attached to the earwire. 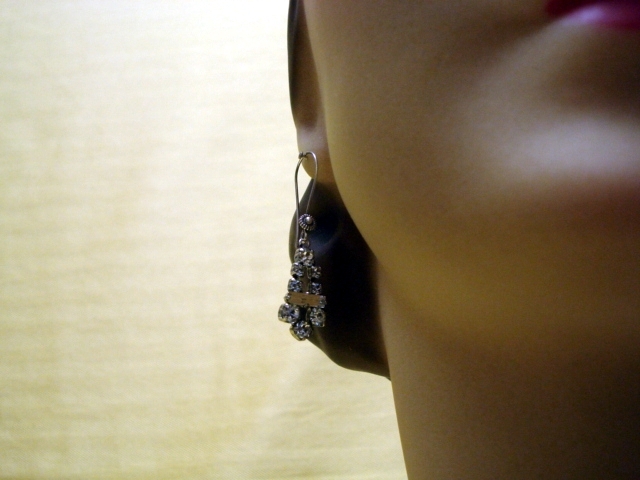 The earrings are pictured on our life-sized mannekin, Ellie, a retro shop fitting which is perfect for modelling old jewellery! 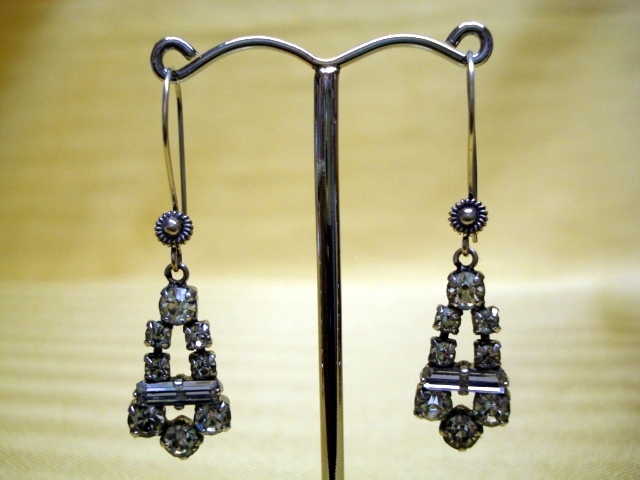 The vintage earrings have a total length of 2 inches including the silver earwires; the diamante drop is one inch in length and nearly half an inch at its widest point. Art Deco jewellery has a timeless and modern appeal and these vintage earrings would match up nicely with the art deco diamante necklaces and vintage collars offered on www.bagthejewels.co.uk. . It is easy to mix and match to find the perfect wedding accessory and ensure that you have a unique suite of bridal jewellery which you will always treasure.